CONTEST LUXE Paris "LOOK of the YEAR"
LUXE Paris Fashion House is dedicated to elegant women and men, the fashion connoisseurs. High quality clothes for all occasions. Be good to you, enjoy LUXE Paris! 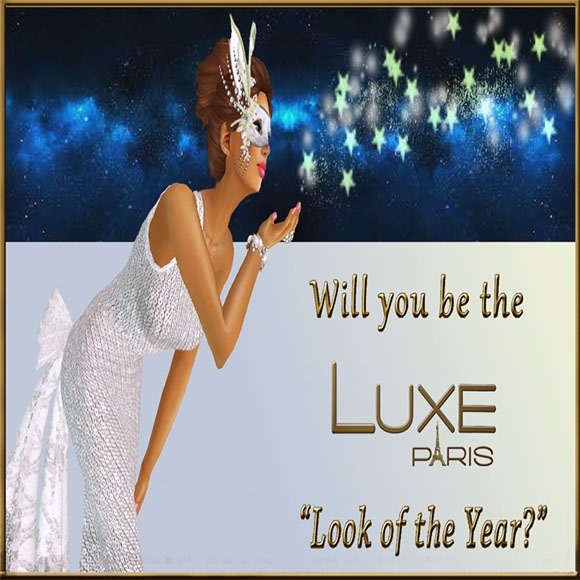 **WEAR a LUXE Paris outfit, style it, snap a picture, put your name in the title and send to LUXEParisLookOfTheYear resident, inworld. You might be the “Look of the Year“ and win 25 000 $L! **10 FINALISTS will be revealed at manierasl.mymaniera.com on July 1st and each of them will receive 10 LUXE Paris outfits! **THE WINNER will be revealed on August 1st and get 25 000 $L and the title of LUXE Paris Look of the Year! **ALL THE PARTICIPANTS that add the secret password, which can be found at manierasl.mymaniera.com (starting May 1st), after their name in the title of their entry, will automatically receive the LUXE Paris Maniera gown. **THE CONTESTANTS WILL BE JUDGED on their style, elegance and originality by Deepthinker Oh, Manistyle editor at Maniera SL magazine, Parisian Skytower and Mika Palmyra, co-owners of LUXE Paris. ** CONTEST OPEN TO ALL SL WOMEN. **YOU CAN ENTER THE CONTEST AS MANY TIMES AS YOU WISH as long you wear a different outfit in each entry. **DEADLINE to submit your picture: June 15th, 2015! Josie wears **RE** Black Heart Necklace RLV and **RE** ReVoX BadAss Necklace –> These are available only at the Men Only Monthly event MOM. Please ask crashnoww for lm. *N*B* Garterdress – new – mesh dress with army textures and mega hud controlled. ALB ANA Fee gown dress elve and ankles by AnaLee Balut. To easter AnaLee Balut made a mesh corset / flexi mix gown. It`s free! Inside you find a hair gift from ShuShu. The full version is available at her section II for only 100L.